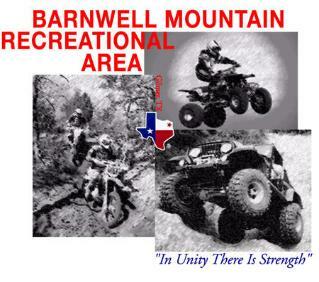 Jay from our XtremeTerrain Facebook Fan Page gave a suggestion for those looking for an off roading spot in Texas the Barnwell Mountain Recreational Park. Although I could not find any specific organized event going on, it appears that this park is open pretty much all the time for off roading enthusiasts. TMTCs 1st Property was officially opened in July 2000 and has become one of the premiere off-highway parks in the United States. BMRA is one of the largest projects principally using the Recreational Trails Program Grant Process. Some of BMRAs amenities include Full Shower and Bathroom facilities, pristine port-a-potties throughout the property, on-site food vendor, a well marked trail system utilizing unobtrusive trail signage designed by TMTC Board Member Bobby Beamer. These signs are now being used at many off-road facilities including the Superlift ORV Park in Hot Springs, AR. This beautiful 1800 acre park located 5 miles north of Gilmer TX on highway 155 is a shining example of what TMTC and its members and volunteers can accomplish. TMTC and BMRA have been recognized by such organizations as Texas Parks & Wildlife, The Blue Ribbon Coalition, Tread Lightly!, National Off Highway Vehicle Conservation Council, The ATV Safety Institute (ASI), American Motorcyclist Association, United Four Wheel Drive Association, Southwest Four Wheel Drive Association, as well as many regional and state organizations. From Gilmer turn east onto Hwy 155 North (this is a stoplight). Go approx. 5 miles and as you start to climb a hill look for a green sign on the left pointing to the right that says “Barnwell Mountain Recreation Area”. You have to watch for the turn off because it is at the crest of the hill and you will miss it if you are not paying attention. This sign is directly across the Hwy from the entrance. Turn right, go through the gate and up the hill…. you can’t miss it.